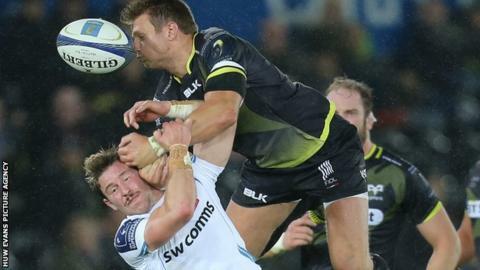 Ospreys will prepare for Sunday's Champions Cup match at Clermont Auvergne "like any other game", says forwards coach Chris Gibbes. The terrorist attacks in Paris mean security concerns in France are high and some matches have been postponed. But Gibbes says the players must try to concentrate on matters on the pitch. "The only thing we can control is to make sure that we prepare like any other game and hopefully the security people do their job," Gibbes said. "It's a tragedy out there, you have to just pray and hope that nothing happens to us and everyone's safe out there. "I don't think the spirit of the match will be affected but I can't speak for the people of France." Ospreys will fly directly to Clermont-Ferrand, in the central Auvergne region, for the match at the Stade Marcel-Michelin. Stade Francais's home match against Munster in Paris has been postponed because of the high level of security in the capital. Ospreys' New Zealand scrum-half Brendon Leonard added: "What's happened in France in the last week is terrible but hopefully they'll get behind the rugby. "Terrible events have gone on in Paris but hopefully everyone can come along and enjoy a good game. "It's a very famous place to go and play rugby over the last five or six years, so I'm looking forward to the atmosphere and everything that comes with it. "We will need to be better than we were [in the 25-13 win] against Exeter, we need to fix up a couple of things but we'll go there with a lot of confidence." Ospreys will be without wing Dafydd Howells after he took a knock in the final minute in the win over Exeter Chiefs. Joining Wales centre Jonathan Davies on the Clermont injury list are New Zealand three-quarters Hosea Gear and Benson Stanley, France prop Vincent Debaty and Georgia prop Davit Zirakashvili.